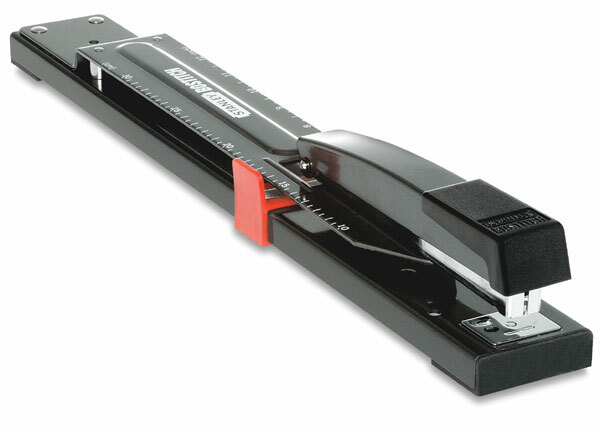 Stanley's Long Reach Stapler, with its 12" (305 mm) stape arm, is excellent for stapling pamphlets, booklets, and brochures. Engineered to eliminate staple jams, this stapler features solid metal construction and uses standard office staples. The Long Reach Stapler features an adjustable paper stop with easy-to-read English/metric rulers. Anchor holes are present for mounting to a table or workbench. ® Stanley is a registered trademark.